“As their teachers, we hold in our hearts our own hopes and dreams for [our students]. We want them to engage in academic rigor and to be ideamongers who contribute to classroom learning—and we also want them to become the very best people they can be; to live the very best lives they can live; and to contribute as best as they can to their families, schools, communities, and our world… But to learn all that, students must master what is essentially a new language—the language of learning. Speaking confidently is just one part of the language of learning, but it is a crucial skill. When we teach students to speak confidently in class, we are empowering them to change the way they view themselves as scholars, the way they connect to and take ownership of the curriculum, and the way that both peers and adults in and out of school perceive them. Essential speaking skills like speaking confidently help students exchange ideas with classmates—expressing ideas in literature circles, productively discussing science concepts, and respectfully debating in social studies. Students of all ages become truly engaged in academics when teachers make space for them to make meaningful connections to the curriculum and dig into topics that they’re personally invested and interested in. When students are engaged and motivated to learn, and when teachers create a safe space within which they can practice, even the shiest among them can learn to speak confidently. Mr. Nelson, for example, deliberately helped his fifth graders to speak with confidence by teaching them the specific skills that academic speaking requires and then providing them with opportunities to practice and master those skills. 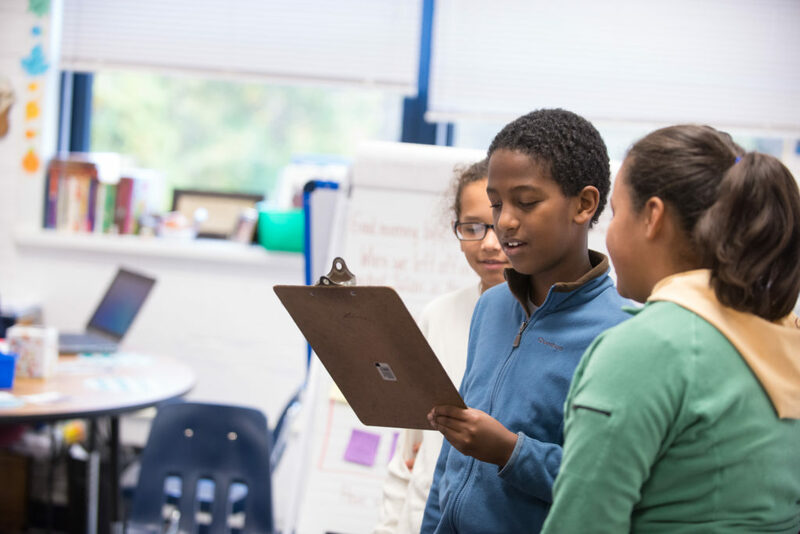 During one writers’ workshop, he refers his students to an anchor chart from an earlier lesson on speaking confidently, briefly demonstrates how the characteristics will apply to their discussions, and then sends them off to work small groups. After he describes how the trees look, how the wind feels, and the “crunchy leaves” and “gooey mud” underfoot, Juan’s groupmates take turns telling him the adjectives and descriptive details that stood out to them. Juan’s ability to express his ideas effectively helped him prepare for writing his story and gave his group members a vision for how they, in turn, could describe their own story settings. Give students plenty of opportunities to practice confident speaking skills. After initial, targeted practice (for example, students can pair up and share about their weekend plans, focusing on making eye contact while speaking), work up to using the whole set of confident speaking skills in multiple settings (partners, small groups, and whole class). The school day is filled with opportunities to practice confident speaking. Enlist students in creating visual reminders that illustrate confident speaking skills to hang in easy-to-see places in the classroom. Use reinforcing teacher language (clear, concise, positive) to give students feedback as they progress. Students need these essential speaking skills as the building blocks for higher-level speaking skills, so they can be prepared for more formal speaking situations and communicate better in social situations. What do confident speakers in your classroom sound like? To learn more about the power of teaching students core thinking, listening, and speaking skills, including specific examples of how to give meaningful feedback and address common mistakes, check out The Language of Learning. Find even more teacher language tips to support your teaching in The Power of Our Words and The Power of Our Words for Middle School.